NG:DEV.TEAM - the developers behind GunLord and NEO XYX - announced last year that they would be releasing Kraut Buster to the Neo Geo MVS and AES in 2016. Unfortunately, they will be missing that date, but it's only because the scale of the game has increased significantly since its announcement. Players will still be able to hop in for some quick arcade-style shooty shooty, but they can also opt to engage in a longer campaign. New difficulty modes impact enemy numbers and behaviors, allowing skilled players to truly test their mettle. The game is now planned for Q2 2017, although that date is not set in stone. 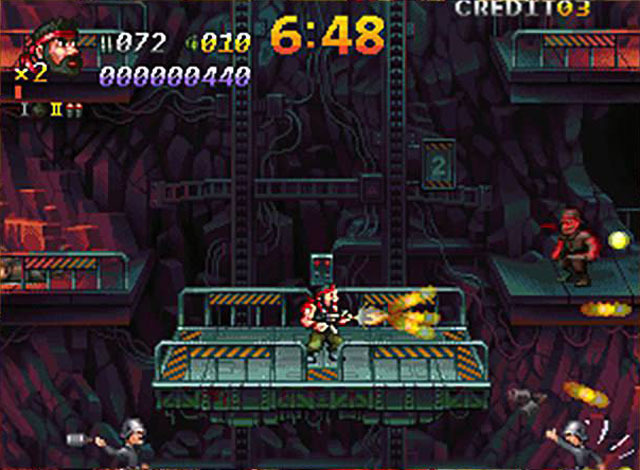 Kraut Buster pays homage to all things Metal Slug, and the player can take on the role of John "Küken" Mallone or Jack "Handsome" Rowdy, or work together with a friend in 2P co-op. Gunners are able to toss grenades and blast baddies, bosses, and minibosses with 8-way directional fire as they work their way through a detailed 60fps pixel world. Where Kraut Buster changes things up is in its mask system... grabbing a mask changes your character's basic abilities and weapons. For instance, grabbing the chicken mask allows the player to slow his falling speed, the Tengu mask gives him a super high jump and lets him move more quickly, and the hockey mask replaces the player's default melee knife with a long machete. Players can also find little yellow chicks that will fly behind them offering support by laying down additional fire.